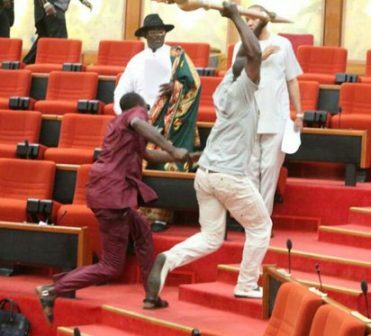 Lawmakers from Nigeria’s neighbours, Ghana were on a visit to the National Assembly on Wednesday when thugs invaded the Senate chamber and forcefully took away the mace. The lawmakers from Ghana were also as confused as their Nigerian counterparts. They entered the House and sat at the gallery to observe proceedings as members debated the invasion. Speaking to reporters, Majority leader of the House of Representatives, Fem Gbajabiamila, however, apologised to the visitors on behalf of the National Assembly. He said, “It is unfortunate that we have visitors from Ghana, who are on a parliamentary visit to Nigeria.